1. Build an octagon out of the eight 16” tubes. This will serve as the pond. Therapist Tip: Children who are working on cutting skills can also cut waves out of the blue construction paper for further practice. Be sure to draw lines for the child to follow if they require a visual pattern to successfully cut the paper. Throw the waves into the pond! 2. Cut the large index cards into the shape of fish. You will need 26 fish. 3. Write the uppercase letters of the alphabet on the fish (one letter per fish). 4. On the index cards or large paper, write each letter of the alphabet. Each player should have four index cards, each with different letters. For example: player one has A, B, C, and D; player two has E, F, G, and H; player three has I, J, K and, L etc. One letter should be written on each. 5. Using tape or hot glue, attach one ³ inch button magnet to each fish on the side where the letters are not written (make it the eye – be creative!). (To decrease the difficulty, attach the magnet to the side of the fish where the letter is written.) It does not matter which side the magnet is attached to on the index card. 6. Throw the fish into the pond! The magnets should be facing up. 7. Cut a two to three foot piece of yarn or string to serve as the the fishing line. If working in a group setting, each child should have their own fishing line. 8. 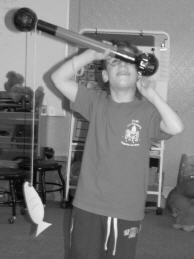 Each child fishing should choose a fishing rod (either a 16”, 24”, or 36” Toobeez tube). 9. As picture below, tie the string to the end (the piece that resembles a key) of the Toobeez fishing rod. Attach the magnet (either side) with tape or a hot glue gun to the end of the string. 10. As picture below, tie the string to the end (the piece that resembles a key) of the Toobeez fishing rod. Be sure to allow children to participate in as much of the set up process as they are able. If a child is working toward a goal that requires them to hold and use scissors efficiently, allow them to cut the index cards into shapes of fish (using a pair of safety scissors). If a student is working on the skills of handwriting their letters, be sure to allow them to use the marker to write the individual letters on each card. If time limits the therapy session, choose the part of the activity that will benefit the child’s development most. The set up of this activity allows a child to practice many important developmental milestones, and this should not be lost due to time constraints. If needed, break this activity into two sessions. One session dedicated to the set up and the next session dedicated to the activity. 1. Review general rules with the individual or the group. For example, everyone will wait their turn, no grabbing each others cards, etc. 2. Read the following Activity Challenge Box. Challenge: Catch the letters that are swimming in the pond and match them to the letter cards held in each player’s hand. The first one to match all of the letters wins! 3. Position the children around the pond, depending on the number of children involved in the activity. If working with a larger group, position the children in a circle around the pond. Therapist Tip: Children should be allowed move around freely in order to catch the fish of their choice! 4. The first child should begin by casting their fishing line into the Letter Pond. 5. If the fish is a match to one of their index cards they are holding, they keep the fish and put their pair aside. Therapist Tip: If working in a group, ask the child to show their letter to the other students. If another student has a match, the letter should be given to that student to make a pair. Each person will get one turn to cast their fishing line and pick a fish. See the picture for an example of a match. Hand-eye coordination and patience allowed these two youngsters to have a successful fishing experience! 6. Continue taking turns to fish. The first person to find all of the fish to match their cards wins! 7. When the activity is complete, move on to the Discussion and Processing questions. How did this activity help you to practice reading your letters? If a child (or group of children) is not ready to match letters, draw a variety of shapes on the fish and their playing cards. If using a few shapes, add more fish by making a few of the same shapes different colors. Children must match the same color and shape to their playing cards. Use a variety of pictures of everyday objects that the child may encounter (for example, a chair, ball, doll, truck, etc.). Follow the same activity instructions. After the student matches the letter, ask them to verbalize a word that begins with their letter pair. Instead of showing the letter to the other players if no match is found, throw the fish back into the pond. Children will need to remember where they placed the fish so they do not catch the same one twice! 5. For children with hearing impairments or deafness. 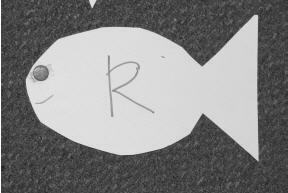 Write individual letters on the fish, but instead of matching the letters to another letter, have the children sign the letter. 6. For children with hearing impairments or deafness. Print out pictures of a variety of signs (American Sign Language) they are learning and glue them to the fish. After catching the fish, instruct the child to finger spell the word or vice versa. 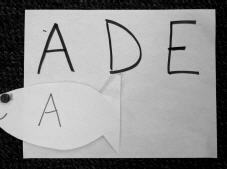 Write words on the fish and, after the fish are caught, instruct the child to match the word to the picture of the sign. 7. For children with visual impairments or blindness. 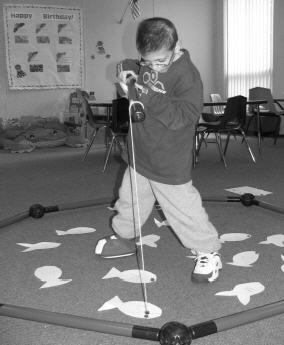 Follow the same instructions as the original activity, but instead of writing letters on the fish, ask the students to write Braille letters on the fish and the playing cards to match. 8. For children who use wheelchairs. 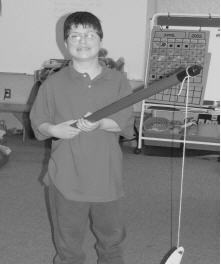 Make sure they receive a 36” tube as their fishing rod so they are able to reach the fish further out into the pond. 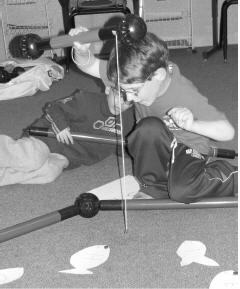 This activity was adapted from the tabletop version of ABSeas fishing game by Discovery Toys.